“Where do start on planning my extended backpacking trip in Glacier National Park?” In Part 1, I explored resources and approach to getting a great extended backpacking trip in Glacier National Park. In this video, I’m providing more specific guidance on routes. Jake, great video! My friends and I just got our permit for GLF -> STO -> FIF -> GRN. We’re stoked about getting the route and campsites. We have hotel reservations before and after our trip at Many Glacier Hotel and will leave our car there. Our plan is to enter at Chief Mountain and come at Many Glacier. Any tips or recommendations for a taxi/shuttle service to take a group of four and gear from Many Glacier hotel to Chief Mountain? Jake, I called them and the shuttle times don’t work out too well. They have one shuttle that leaves Many Glacier at 1PM and will arrive at Chief Mountain around 2:30/3:00… a little late in the day for a ~10mile first day in! We were hoping to get a much earlier start. I’m looking forward to reading your future blog post on this topic. If you know anyone who does private shuttles, please include that in the post. If we’re each going to spend $20 for a bus shuttle ($80 total) that can go along with a private taxi. I might be reading it wrong, but it looks like it’s $15 a person and leaves at 1pm (later than one would like for sure, but not insurmountable). I would estimate you’d be on the trail at 1:30. It’s not very far from Many Glacier. Also, the hike is downhill, then basically level, so you could expect to be in camp by 5:30 pretty easily and the days are long. Yes, I did misquote the price. The rep I talked with said to expect the trip to take 1.5 to 2 hours from Many Glacier to Chief Mountain. I’ll call them back next week and hopefully connect with a different rep. Thanks! Jake, your videos are awesome and have inspired me to go for the belly river this coming week! Seeing your coverage of that area and educating me on the shuttles available (since we will be there in June, not all park shuttles are running, but you educated me on the GPI!) I know it’s early in the season but plan on making the best of it! We are planning 3 nights from Chief Mt. out Goat Haunt. What are your thoughts on crossing Stony Indian Pass this early in the year? (June 24th). Unless you’re really good with crampons and ice axes, you won’t be able to do that trip. June has persistent snow and Stoney Indian Pass can be tricky… and we just got a bunch more. I’d suggest an alternative of staying in the valleys of Belly River and Mokowanis. Perhaps coming in the first night to Elizabeth Lake, then next night go to Glenns or Mokowanis and day trip up to the Stoney Indian Basin. The last night spend at Cosley Lake and, in the morning, hike up to Bear Mountain Point, then out. You’ll have an amazing trip. Jake: Thanks for the content. 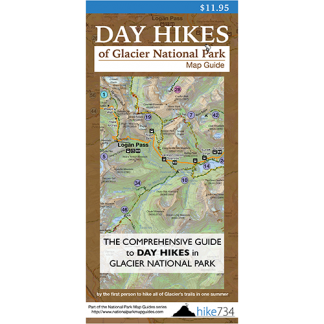 I’ve got your Day Hikes map and am trying to determine whether it will be feasible to go from Goat Haunt to Glenns foot on day 1, glenns foot to many glacier on day 2, and over to granite park on day 3. Assume that we have some decent stamina (did Jackson Glacier Overlook to Sperry Chalet last summer in pretty good time, but without a lot of gear). I see a fair amount of yellow and red on your map and other guides describing at least parts of these stretches as strenuous/very strenuous. We’d spend the night at the goat haunt shelters to get on the trail early on day one. Thoughts? Make sense to go a bit further east on day 1 to glenn’s head or Cosley? I think that I’d get to Cosley on day two. You’re definitely swinging for huge days going over Stoney the first day, Ptarmigan Tunnel the second day, and Swiftcurrent the third day. The nice thing is that you can bail on your routes if you think you’re overdoing it. Should be an amazing trip though! Would like to do the northern circle but only have 4 nights/ 5 days. Would it be possible ( enjoyable) to spend 1st night at Elizabeth lake foot or Cosley lake. 2 nd night at Stoney Indian , third at fifty mt, 4 th at Granite Park, then out to Many Glacier? I think you will probably be good as long as you’re good with one bigger day… only you can be the judge of that. 😉 All the days are pretty decent efforts, so you don’t want to add too much, but I think you could probably cheat it. Appreciate the video. Planning a trip for August with family. And want to do the northern circle. Kids are 7 and ten. What is longest, most difficult day? Any fords or other that might make difficult to do for kids? I think the hardest day is from Fifty Mountain to Granite Park (that’s what I remember anyway). The biggest ford is the outlet of Cosley Lake, but you can go around that by adding a bit more trail. The only other fords are up by Stoney Indian and they should only need a hand hold from a parent. They are short and should be tame by August. Good on you for taking your kids out there!! Hi Jake! We have used your videos and day map to plan our trip this Aug. we just got our permit for 2 Medicine north shore to morning star to red eagle to Reynolds to gunsite to sperry trail head. Very disappointed we didn’t get northern loop like we wanted. Seems like this permit has us doing some fairly long days and 1 day (gunsight) at 4.9 miles. How tough of a pace will we have to keep doing 3 consecutive days of 14+ miles? Also if we want to add a 5th hiker to our journey how strict will the NPS be on 5 people in a campsite? Well you may be disappointed now, but you won’t be! That is a great trip. You will have big days, but get early starts. As far as adding a fifth, you’ll definitely need another campsite… it’s a rule, not a guideline. If you decide that the journey is too big for you, you can always start your hike up through the Dry Fork drainage or up Cutbank. The big thing is you have a great trip and you can go from there when you pick up your actual permit. If you don’t know what kind of hiker he is, I’m not sure I will either! 😉 I think a nice, varied trip could be hiking to Poia Lake, then you’d have a bigger day going to Elizabeth Lake, but then you could take it easy and hike up to Helen Lake for another camp spot or a day trip. Then work your way up the Mokowanis drainage. From there, you could day hike up to Stoney Indian Pass and Bear Mountain Point near Cosley. That way, you’re not committing to a big day, but you have bigger day options. I’d also consider a one way trip from Two Medicine to St. Mary or vice versa. I think we are going to do two medicine to St. Mary’s and maybe put on too Many glaciers will see how it goes and we’ll have 2 cars with us also so its going to open up our options being able to shuttle ourselves. A one way trip is probably what we’re going to do. Thanks again Jake! Maybe I’ll see you on trail. Did you ever make the 3rd video in this series? I didn’t. Maybe when I work on my Backpacking Guide someday…. Hello! What great site how grateful I am to find you! I would like to plan my first trip I did maroon bells last year with friends and relied heavily upon them. Now i have to be the planner. We live close to here and I think this would be a great trip maybe about 26-35 miles 3-5 days? I know nothing I would like an easy hike as to not get lost. We are in great shape and climb many 14ers so are well versed in hiking. Where should I start and how does the permit work? Do you need bear canisters in this state? No need for bear canisters, but have your food in stuff sacks with a 25′ length of rope that you’ll hang when you get to camp. Check out my blogs on all the backpacking stuff where I’ll answer many of your questions, then come back! When you are backpacking these trails how likely/often do you see other backpackers? I am used to backpacking in very remote parts of Colorado where I often never see another individual for 6ish days. I am curious what to expect in the second week of July. You’ll see people every day, but may have hours without anyone. It really depends upon how far from access you are. Great vid. Wanted to know how to get transportation (public or private) North of Polebridge to Kintla Lake? I know it’s complicated but would love to see that part of North Fork. Great to find Hike734! I’m trip planning with for my family, including two girls 13 and 11. They carry their fair share, but we are not up for mountaineering (ice ax/crampons) or days >8-10 miles. We are experienced in back country WY. We are looking for spectacular views and maybe extra excitement (ferry ride, challet, etc.). After listening to your vids, I am wondering your recommendation for our first trip to Glacier: 1. Logan pass/granite pk/many glacier/Piegan pass; 2. Goat Haunt/lake francis/hole in wall/goat haunt; 3. Old Man TH/Old man CG/No name via passes/Old Man TH. I had wanted Logan/granitepark/fiftymt/goat Haunt but the distances and shuttle have me scared off. I’m super stoked you’re showing your girls backpacking! I like what you’re thinking for trips. The first one won’t work due to restrictions on those campgrounds. Granite Park needs to be part of a multiple day trip and Many Glacier can’t be the first or the last day of an itinerary so, by definition, it rules it out. (This is due to their popularity and to help with those doing the CDT.) The other two options are super great! I would swing by Kootenai Lakes on the way in to see if you see any moose just for fun. I also like the Pitamakan-Dawson loop. Also consider put down the opposite direction when you apply for your advanced reservation permit. Another one that I don’t see on there is going through Ptarmigan Tunnel, then Redgap Pass to Poia Lake, then out. I kinda like doing that one with Poia Lake first, but both ways have the stunning surprise of entering into the Belly River which will take your breath away. Just make sure you get all options put together and apply on March 15th! I just found your website today and it looks like it has a lot of great information. I’m planning a trip for late Jul 2019 (have to leave by Jul 31st so that is limiting my route choices). Group will be 6 or 7 people. Trip plan is 5 days / 4 nights with a max of ~ 10 miles per day (total 40 to 50 miles). One route I’m considering is following the CDT from Two Medicine to GTTS Rd. Are there any other routes that you suggest I consider? I have reviewed your website and the two backpacking videos. I’m planning a 5 days / 4 nights trip between Jul 21-31, trying to keep the mileage at about 10miles/day. I would like to get your thoughts on the following itinerary: Logan pass to GRN, to MAN, to ELF, to MOL, and out at CME. The last day out is a little long at 14.4 miles but mostly level or downhill except for the last 1.5miles. What do you think? Love the site, it is by far the most comprehensive source for Glacier backcountry info out there. You’re the man! Hopefully this comment isn’t too long. My wife and I are in the early stages of planning a trip out to Glacier in the 2nd week of September. We’ll be out there about 7 days, looking to spend about 4 days, 3 nights, in the backcountry. I’d like to get your thoughts on some of the routes we are thinking of. The first would be Two Medicine to St Mary via Pitmakan Pass and Triple Divide Pass, so staying at OLD->ATL->REH/REF. Another thought is Gunsight Pass, SPE->ELL->GUN, which would give us a chance to possibly check out Sperry Glacier, though i noticed you said Lake Ellen may be a hard site to get. We’d also be open to a variety of other routes as well, such as some type of out and back in the Bowman Lake or Belly River areas. Our biggest concern though is my wife’s moderate fear of heights. She tends to have the biggest issues with spots where there’s a combination of narrow trails and relatively steep drop offs. For instance we did the Bright Angel Trail at the GC last November and while she got through it (helped by how wide the trail generally is) she did spend a good deal of time battling her fear, and was haunted by the prospect of having to go back up once she had gotten to the bottom. Would you advise us on any paths we might want to avoid that would pose an issue to her in that regard? Thanks in advance and for everything you do!